We conducted our first ever general knowledge quiz on our brand new app 'Quizzr' on CrazyEngineers IO. 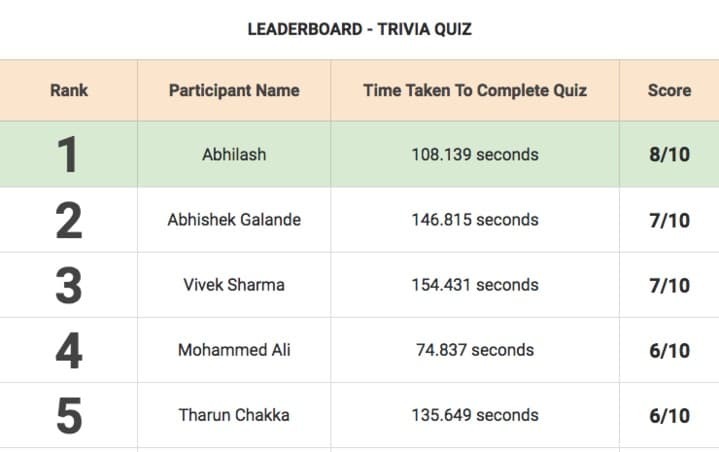 We are super happy to inform you that the response was phenomenal and we've picked up top five scorers who completed the quiz in shortest possible time. Quizzer will soon get its second quiz and we'll notify all our CrazyEngineers IO members via email. If you are not a CrazyEngineers IO member yet, head over to CrazyEngineers | CrazyEngineers Network and get registered (takes < 10 seconds, try it! ).